The TK-6000 comes standard with 45 raised keys and 108 key reversible spill-resistant flat keyboard. This is an excellent feature for restaurants as the keyboard can be flipped for different menus. The TK-6000 has an optional RAC-9 memory card. This card contains your system program which can be transferred to other TK-6000s for quick system program uploads. 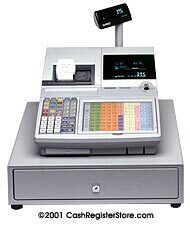 Another handy feature on the TK-6000 is the guest check tracking system. A stand alone detailed check tracking function provides the capability of handling the check items in the food industry and specialty restaurant markets. Up to 200 tables with a variety of items can be controlled. Another outstanding feature is the TK-6000 can be programmed and used in Spanish, French and German.